Mothering chicken eggs is not for everyone, but if you think it might be your calling, here's how to do it. Once a hen lays a clutch of eggs, instincts take over. They constantly fuss over them, adjusting them just so throughout the day and rarely leaving the nest for more than a few minutes. Motherhood is a big responsibility for a young hen – if she’s the least bit neglectful, her babies will never hatch. Or worse, they may hatch with deformities. Modern chickens, it turns out, are not always very effective mothers. Whether it’s genetic or culture, who knows, but they get distracted, other hens oust them from their nest, the rooster comes by… there’s no shortage of things that can go wrong. For this reason, most farmers and backyard chicken enthusiasts don’t trust incubation to their hens, they take it upon themselves to do the brood work instead. You can also buy day-old chicks and skip the incubation process, but it costs more. Plus, why would you want to miss out on an opportunity to experience one of life’s miracles? Temperature: The eggs need to be kept at 99.5 degrees at all times; just one degree higher or lower for a few hours can terminate the embryo. Humidity: 40 to 50 percent humidity must be maintained for the first 18 days; 65 to 75 percent humidity is needed for the final days before hatching. Ventilation: Egg shells are porous, allowing oxygen to enter and carbon dioxide to exit; incubators need to have holes or vents that allow fresh air to circulate so the fetuses can breathe. Homemade versions usually involve some sort of insulated box – a cheap Styrofoam cooler will do. An adjustable heating pad or a light bulb on a dimmer switch will suffice for the heat source and a pan of water with a sponge in it will make the air humid. Low-end commercial incubators don’t amount to much more than this, but the more you pay, the more automated the temperature and humidity controls will be. A high-quality thermometer and hygrometer (a device to measure humidity) are the most important tools of incubation; cheap models are usually not accurate enough. If you’re not working with an incubator that has these instruments built in, opt for a combo thermometer/hygrometer with an external display. These have a sensor that goes inside the incubator with an LED screen on the outside that shows the temperature and humidity readings without having to open the incubator and ruin your carefully calibrated environment. One time-saving feature is a device to rotate the eggs automatically. Much of the fussing that a hen does over her eggs comes from an evolutionary instinct to constantly move them about. The finely tuned ecosystem inside a chicken egg is kept in balance by constantly changing the position of the egg. High-end incubators have a built-in egg turning device, but there are also standalone egg turners that can be placed inside a homemade incubator to do the job. Or, you can rotate manually according to the instructions below. The incubator should be placed in a location with the least possible fluctuation in temperature and humidity throughout the day – a basement is ideal, a sunny window is not. If you already have a flock of chickens that includes a rooster, the majority of the eggs they lay will be fertile. Collect them as soon as possible after laying and transfer to the incubator. If you don’t already have chickens, find a friend or a nearby farmer who does and ask if you can buy some fertile eggs. Websites like Craigslist and BackyardChickens.com are a good way to link with people that may have eggs to spare. Some feed stores sell fertile eggs in the spring and there are many suppliers that sell eggs online. The closer to home, the better the egg source. The jostling about and fluctuations in temperature and humidity that occur during transport are hard on the developing fetus. Hatching rates on eggs straight from the coop are often in the 75 to 90 percent range; with mail-order eggs, there is no guarantee that any will hatch. When picking eggs to incubate, use those that are clean, well-formed and full-size. Above all, do not clean the eggs – there is a naturally occurring coating that is vital to the success of the embryo. Wash your hands before handling and be as gentle as possible, as the embryos are extremely susceptible to damage from sudden movements. Ideally, the eggs are transferred directly to the incubator, but it’s possible to store them in egg cartons if needed. Kept at temperatures between 50 and 60 degrees and 75 percent humidity, the development of the eggs can be delayed for up to ten days without sacrificing the viability of the embryos. However, they must be stored with the fat side of the egg pointed up to keep the embryo alive. It takes 21 days on average for an egg to hatch once incubation begins. 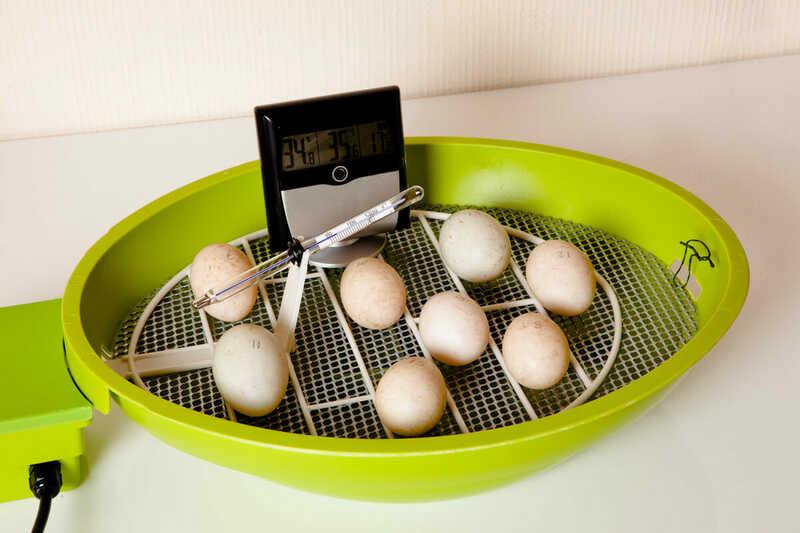 Before placing the eggs inside, turn on the heat source and measure the temperature and humidity over a 24-hour period, making adjustments as necessary to create the optimal environment. If the humidity is too high or low, use a sponge with more or less surface area to adjust it. Raise and lower the temperature of the heat source in tiny increments until the thermometer reads 99.5. Once the incubator is functioning properly, it’s just a matter of maintaining the environment until the chicks hatch. Place the eggs on their side in the incubator, close the door and check the levels religiously to make sure nothing goes askew. Water may have to be added to the pan occasionally to keep the humidity up. At day 18, add more water to boost the humidity level. Draw an ‘X’ on one side of the egg and an ‘O’ on the other to keep track of which eggs have been turned. At least three times a day, gently turn the eggs over; more frequent turning is even better, but the number of turns per day should be odd (3,5,7 etc.) so that the eggs are never resting on the same side for two consecutive nights. Experts also recommend alternating the direction of turning each time – the goal is to vary the position of the embryo as much as possible. Continue turning until day 18, but then leave the eggs alone for the last few days. In the final days before hatching. the eggs may be observed shifting about on their own as the fetus becomes active. The chick will eventually peck a small hole in the large end of the egg and take its first breath. It is normal at this point for the chick to rest for six to 12 hours while its lungs adjust before continuing to hatch. Resist the urge to help with the hatching process – it’s easy to cause injury! how to adjust humidity in incubator? I’m a preschool teacher. How about the weekends I won’t be able to turn the eggs. Will the survive? I have an incubator which has thermometer and hygrometer. Thanks for the info. I know you said humidity on lock down should be 65 to 75. I have read hundreds of articles about humidity and all are different. I just locked my eggs down yesterday. My humidity has stayed at 75% maybe 73% at times. Is this high? Do you think I should lower it? I am so worried I have killed my eggs with 75%.